Do you want to work as a professional coach? People come to you for advice, and you have a positive influence on them. You see the potential in people and want to encourage them to use it. You find it valuable to have healthy relationships and a balanced life with many interests. You value personal growth and want a career with a lot of personal and financial freedom. Do any of the strike a chord with you? With iPEC Coaching you get a certified diploma in 7 months, and you can get started as a coach! The iPEC training programme is a hands-on programme that is developed and led by leading global coaches and thought leaders in the field. You can choose from various specialisations, such as life coaching, business coaching, executive coaching, corporate coaching and many others. You can easily combine the programme with a (full-time) job. What makes iPEC coaching unique? The training programme is all-inclusive, so there are no hidden extra costs. The intensive training programme consists of a combination of online training, video conferencing and in-person group lessons. You learn not only to become a coach, but coaches are available to you as well! A success coach helps you to get the best out of yourself, both personally and professionally. 85% of our graduates coach paying clients. Are you wondering if iPEC Coaching is something for you? 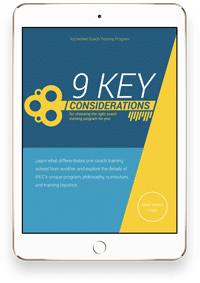 Then download the free guide with the 9 considerations to select the best coaching training for you. "Being able to work with whomever I want, working wherever I want, helping people to see and grab opportunities, I like that in coaching."